Interested in Sharing Knowledge & Facilitating Change? You've come to the right place - Join Farm School NYC's Training of Trainers course! Below you can find out all the details about Farm School NYC's Training of Trainers course, the first course of our curriculum cycle and the foundation for all of our courses. Thanks for your interest in Farm School NYC and if you have any questions we don't cover here, you can reach out to Farm School NYC's director, Onika Abraham anytime. This dynamic 5-session, 21-hour course explores popular education methods, emphasizing the concepts of learner-centered teaching and hands-on, participatory learning. Students will explore various styles of learning, and practice planning, designing and leading an effective workshop in a farm, garden or other growing-related community setting. 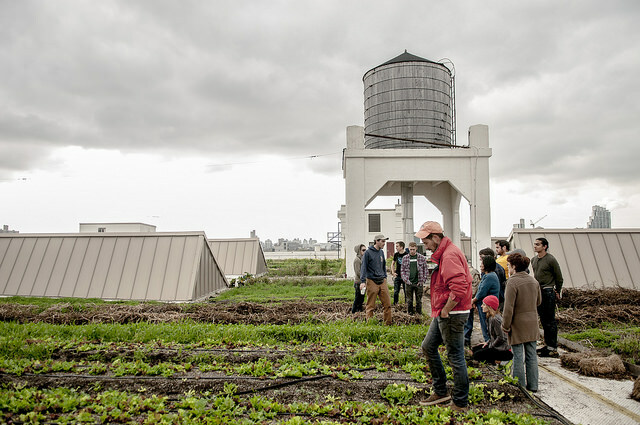 Training of Trainers is one of Farm School NYC's foundational courses, the basis of all of our subsequent coursework. This course will be held twice weekly, on Wednesday evenings and Saturday mornings/afternoons, and co-taught by Owen Taylor and Greg Anderson. All classes will be held at 114 West 47th Street, Suite C1-35 in midtown Manhattan between Broadway and Sixth Avenues. "I love that the skills I learned in TOT continue to prove useful every day. The course provided me with a truly fresh (and liberating!) perspective on education. Owen and Greg were wonderful instructors -- they created a space that allowed me to learn just as much from my fellow classmates as I did from them!" "I love Owen and Greg! They are an excellent introduction to the kind of care and understanding that embodies the goals of Farm School." "I love exactly what it is. Training of Trainers. The truth is that everyone that comes into a space is an educator with prior knowledge and thoughts that can and should be built upon. Training of trainers rocks!!! YES!!!" Greg Anderson, Manager of Just Food's City Farms Program, has co-taught several Training of Trainers courses; given many workshops on chicken care, soil health and cover crops; and built more than 10 City Chicken Project coops since he began working with Just Food in 2008. Greg was a Youth Development Specialist for 13 years, implementing youth programming in Queens, NY. He also helped lead the effort to bring Walt L. Shamel Community Garden back to life in Crown Heights, Brooklyn where he and his family have lived for the past 20 years. Owen Taylor works as the Seed Collection Manager at Roughwood Seed Collection, where he maintains the seed library, runs a volunteer program, leads workshops, and plants and cares for heirloom plants. Owen has served as an instructor of the Training of Trainers course since 2007. He formerly served as Just Food's City Farms Program Manager, a role in which he trained community-based trainers, provided professional development for trainers, supported development of community-run livestock projects, and led chicken coop builds. Food Justice: With NYC as the stage, this course will provide an overview of food politics, food justice issues and approaches. This course will look at economic, political and social disparities, and the innovative people and projects working to overcome them. This course will include an intensive weekend Undoing Racism training, giving students a food justice foundation to build on in their food movement work. Botany: Study the plant body and the main component parts of the plants we eat: roots, stems, leaves, flowers and fruit. This course will better prepare students for Propagation, Growing Soil, Plant Health and Crop Management.